e-WV is easy to use, but there are a few features available only to registered users. 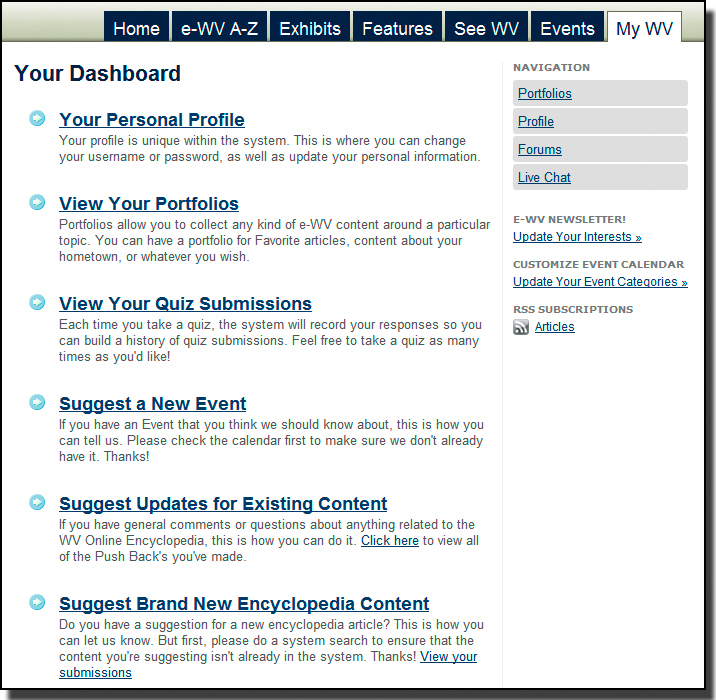 After you join, you can create portfolios, leave comments on articles, track the results of your e-WV quizzes, and more. Joining e-WV is free and easy. The Registration and Sign-in link is on the upper right of every e-WV page, including this one. Just find it and click. The link opens up into a box where you can sign in (if you already have an account), or click to create one. Simply fill in all the boxes for your name, email address, password and so forth. We ask you to type your email and your password twice to confirm they are right. Filling in your address is optional, but we appreciate knowing where our visitors are coming from. We never give away or sell your information. If you enter your zip code, the home page will show your local West Virginia weather when you're logged in to e-WV instead of showing Charleston. After entering your information, when you click "Register for e-WV," you will be taken to this page. This is very important. An email will be sent to the address you entered on the sign-up page. You need to open that email and click the link in order to finalize your registration. If you don't see an email, check the spam folder in your email program. Once you click that link, you'll have full access to extra e-WV features as found on your new My WV tab. If you have any questions about registering for e-WV, contact Mike Keller at e-WV: keller@wvhumanities.org or 304/346-8500.